Every Thursday in October 2013 Scouts throughout the Western Cape took on the Provincial Commissioner Paddy Milner’s challenge to promote the SCOUTS South Africa brand and the purple and white colours. Many Groups developed new signage for their halls, others purchased feather banners and SSA branded clothing but Mathew Broadley and Morgan Irwin took it to another level. They combined adventure, excitement, hiking and branding when initiating the very successful “Paint the Lion Purple” campaign. 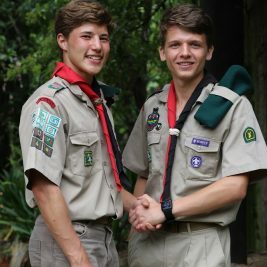 Over the month of October they welcomed hundreds of Scouts from various Troops throughout the province at the mountain aptly named Lion’s Head in Cape Town. They all wore the SSA branded clothing, caps, T-shirts and hoodies and climbed up the mountain in our Scouting colours. It was a breath-taking sight and all children, youths and adults that participated had great fun in representing and living the Scouting adventurous brand. Is your Troop or Region up to adventurous branding challenges in 2014?